In front of the lens for once! A rare appearance of Margaret Stevenson, who is usually behind the camera lens rather than in front of it! Margaret has maintained our club archive over the last 20 years, compiling photo albums to help preserve our history. She has now handed over the reins to another club member. President Cathy presented Margaret with a token of thanks for her great work in recording many club events over the years. The Committee In/Out meal was held at the Risley Park. The old and the new committee had their customary traditional evening of fellowship together. A good meal was enjoyed with plenty of chat and much laughter. The eight past and future committee members who were able to attend, in no particular order – Andrea Tew, Diane Addy, Cathy Griffin, Jane Markwell, Margaret Stevenson, Pauline Sheehy-Smith, Yvette Thomas, Ann Gregory. Happy 30th Birthday! Members of the Inner Wheel Club of Church Wilne celebrated the 30th Charter of the club at Erewash Valley Golf Club. President Cathy Griffin hosted the event with Inner Wheel District Chairman Di Hylton and her husband John, and Rotary President Simon Beal and his wife Angela as guests. Prior to the meal the candle lighting ceremony was held: Immediate Past President Diane Addy lit the candle to represent the past, remembering former members and also Paula Hammond who sadly passed away this year. Current President Cathy Griffin lit the candle for the present and Jane Page, as the newest club member, lit the candle for the future. Cathy provided a superb fruit cake which was cut by her and Di. Following the meal we enjoyed dancing to the 80's disco. Moved away from our regular Tuesday in March there was a good turn out for what ended up as pure mayhem. The Club Secretary arrived with her two assistants – Ann Gregory and Cheryl Chapman bringing to the meeting Dominos, Snap cards, Beetle Drive, Bagatelle, table skittles and Boggle. Teams of two entered into battle with just seven minutes per game time was tight and the competitive spirit high. By far the noisiest game of the evening was bagatelle. Did you send the balls up one, two or more at a time? The more balls sent up together the noisier the game and the more fun watching where those ball bearings were going to fall. At the end of the evening Joyce Stokes and Jenny Lord were victorious but Monica Welbourne and Shirley Martin look pretty pleased with their wooden spoons. A real evening of fun and fellowship. The winners have a nice Easter Egg to look forward to. April Fool's Day – but those who attended the afternoon pamper session hosted at her home by Vice President Stephanie Cook were no fools. President Cathy Griffin kindly provided all of the products which we used and she took us step-by-step through a DIY facial, finishing off with a hand wax treatment which left our hands feeling really soft and smooth. Stephanie, with some help from her friends, put on a wonderful spread for afternoon tea and we all enjoyed savoury bites followed by a wonderful selection of home-baked cakes. Those who were brave enough followed all of this up with a refreshing dip in the pool afterwards. As there were more cakes than we could eat, we all took a plate home with us, much to the delight of our families! A beautiful afternoon for us all. You're joking . . . you're not going to take a photo now are you? No . . . you can answer the doorbell . . . Concentrating on perfecting facial massage technique . . . It is with great sadness that the Members of the Club received the news that Paula Hammond died on 25th March 2017 after a short illness. Paula was an active member of the Club. A founder member and a dear friend. She rarely missed a meeting and enjoyed many of the social events. She had held office as Club Vice President, then President. Outside of Inner Wheel she was a Magistrate from 1974 to 2014 being Chairman of the Bench in Nottingham from 2008 to 2011. She was remembered as a "conscientious" JP who "served with distinction". She was also a very active member of the Girl Guides as a brownie leader. Paula was awarded the MBE for services to the community is 2011. Her funeral service at Attenborough Church was a fitting tribute to a life dedicated to service and helping others attended by so many that the Church was full. Paula and her husband Michael's 50th Wedding Anniversary. Our Race Night was held on 25 March 2017 to help raise funds for President Cathy's chosen charity - Genesis Research Trust. There were 8 exciting horse races and tension rose as the punters avidly watched each race to see if their horse would be a winner. The sponsor of each race named the race and also had the pleasure of presenting a prize and rosette to the winning jockey of their race. During the evening a supper of steak pie and chips was enjoyed by those attending and Rotary ran a licensed bar. There was much hilarity ably assisted by "jockey" Adrian. A great evening enjoyed by all. "Jockey" Adrian eyes up the prizes. Nice weather for ducks – it poured all day, but the rain and wind did not deter Jane Markwell, Freda Smith and Jane Page from Church Wilne and many fellow Inner Wheel Members in District 22 from taking part in the Step and Smile sponsored walk. District Chairman Di Hylton helped to book everyone in as we arrived and joined us on the way round. Jane M helped to marshal the walk, whilst Freda and Jane P marched by in the rain. We walked approximately 5 miles, along part of the perimeter of East Midlands Airport. Many walkers were wearing their silliest socks to support BEAT's Sock it to Eating Disorders campaign. Inner Wheel Association President Zena Coles, who chose to support BEAT after her family was personally affected by eating disorders, paid a surprise visit to help rally the walkers on their return from the wild weather outside. The hot soup enjoyed by us all was a welcome reward, as we left our coats dripping on the backs of our chairs. A total of £5,076.19 was raised through various events held by the clubs in District 22. After our meal we had a talk by Malcolm Sales about his voluntary work for the charity Remember My Baby. He is a professional photographer who takes remembrance photographs for the benefit of parents who have lost their baby before, during or shortly after birth. Sometimes Malcolm's services are booked in advance and sometimes he is called in with very little notice. This was quite a tough subject to learn about and Malcom said that whilst he is emotionally affected by this aspect of his work, it is rewarding to see the comfort which it can bring to families who use his services. At our first meeting of the New Year we were pleased to welcome Rotary President Simon Beal. Simon gave us a very interesting talk about his life as a Rotarian, telling us about his involvement in his younger days, followed by a break and then his return to Rotary. Simon very much enjoys the service and fellowship in Rotary – when he returned to Rotary, he realised just how much he had missed it. He is finding it particularly fulfilling in his service as President of Church Wilne Rotary Club this year. President Cathy Griffin inducted Jane Page as the newest member of the Inner Wheel Club. Jane was introduced by member Karen Knapp. Jane thanked members of the club for the warm welcome which they had extended to her. What is nicer to do on a cold Tuesday evening in January than to meet with friends to mark Inner wheel day and raise valuable funds for the International Service Officer. Shirley Martin opened her home for a cheese and wine evening. With special thanks to Monica Welbourne, Joyce Stokes and Jan Woodhead who assisted with setting up. A fantastic array of items was available to buy on the Charity Table. The most amazing basket of fruit was on offer for the raffle. With a good selection of different cheeses, various nibbles, lovely cakes and puddings the evening raised a fabulous £313. Shirley in thanking all those involved said that the sum raised "should be sufficient to pay out everything that International support". She felt that the "fellowship and friendship was excellent". The items left over were taken to the January meeting for sale with anything left over after that being donated to a charity shop. and the number of decibels they can generate! President Cathy Griffin and the members of Club gathered for the annual Christmas Dinner at Erewash Valley Golf Club. The tables were beautifully decorated and everyone was set for an evening of fellowship what we did not expect was a visit from Santa Claus. He duly arrived to join us for a very tasty meal. He was very impressed with the table brimming over with gifts donated by the Club members for the Salvation Army to distribute to children from babies to teenagers. All were brightly packaged and suitably labeled for ease of distribution. Waiting in the wings was a large sack full of Secret Santa gifts ready for Santa ably assisted by President Cathy to distribute. There was considerable laughter as each member was called up to receive her present. All photos with special thanks to Santa for his permission to publish even though it might give away his identity!! In the dark and hectic days leading up to Christmas what you really need for a tonic is a good laugh and this was provided in buckets full by Cathy's idea for the November meeting. All members had been charged with the task of providing to President Cathy a pre-school photograph for putting into a collage and then armed with a list of all the members, in teams it was time to put names to the faces. This did not prove to be an easy task especially to the newer members who are still trying to get to grip with the names of the faces they see every month. It also was not helped by the fact that in some cases there was more than one photo and not all of the members whose photos were included attended. Nevertheless, despite these difficulties and with some general collaboration, in the true spirit of friendship a winning team emerged. You will have to guess who but it was not the writer. Guess who the babies are. No cheating now, the answers are at the bottom of the page. Monica Welbourne and Paula Hammond deep in thought. Now who is that in the middle? Who is this cute little girl? It must be our leader! This is a regular feature in the Inner Wheel calendar and is eagerly awaited by the more competitive among our members. For others the fish and chips are the most important part. In total fifty-nine members and guests entered into competition, or should I say battle. President Cathy assured her team that we were likely to win the wooden spoon, the writer being one of her team, could empathise with this view. However, much to Cathy's surprise, and mine, we were nearer the top than the bottom of the list. This had much more to do with Cathy's two daughter's knowledge of pop and celebrity than mine! Quiz Master David Corner presented us with some very challenging rounds especially the pictures and the music. At the end of the evening, one team had to be triumphant and they were Freda Smith and her crew – Smith plus two. More importantly, the sum of £378.07 was raised for Cathy's Charity Genesis Research Trust and everyone present had enjoyed an evening of friendship. After a break in August, the monthly meetings for the Club resumed with the visit from the new District Chairman for District 22. Di explained the various roles that she has held in District 22 before being elected to second Vice Chairman two years ago. She was aware that being District Chairman would be a busy role but perhaps it was only after her induction she realised just how busy. With 29 clubs in the District, 28 of which she needs to visit her diary very quickly became full. Not a person to be daunted she was looking forward to her year in office and having the opportunity to meet many members of Inner Wheel. She encouraged the members to become involved with the National Conference, which in 2017 is to be held in Nottingham. She wants her year in office to be one full of "fun and friendship" and particularly to promote this objective of Inner Wheel. President Cathy with District Chairman Di Hylton. She also explained the charity that she would be supporting in her year in office – Hearing Dogs for Deaf Children, and the reasons for choosing this particular charity. Cathy presented Di with a cheque for her chosen charity. On a lovely sunny day the 11th September 2016, Inner Wheel members volunteered their time to provide much needed refreshments to the 232 riders in the Charity Rotary horse ride, held in South Derbyshire. Family and friends were also in attendance to make the day a really great occasion, and our volunteers worked tirelessly to make sure everybody was well nourished on a very warm afternoon. Andrea hands out water to the riders part way round the course. 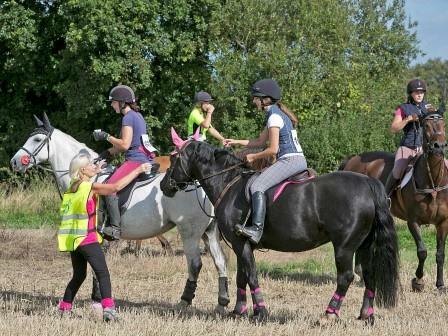 The riders were afforded the opportunity to explore farms and land not usually open to them. Afterwards, the introduction of cakes to supplement the tea, coffee and cold drinks on offer went down particularly well this year in the refreshment tent, with the usual offering of burgers, bacon and sausages on the BBQ proving as big a hit as ever. This was all possible thanks to the large number of helpers offering their time throughout the day, which proved especially busy when the ice cream was made available! 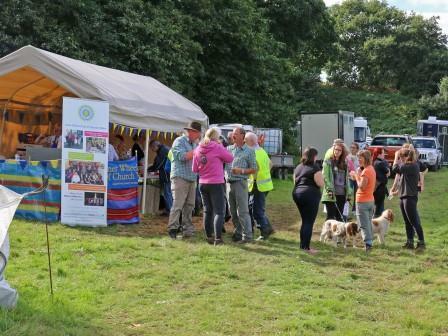 Our sponsors – Bluebells, Warburton's, Tesco, Coop and Morrison's were especially kind in offering food and drinks to be served throughout the day, as well as helpful donations from Inner Wheel members and the local public. Gathering outside the refreshments tent enjoying the delicious food. A total of £753.85 was raised on the day - a fantastic amount which will be donated to Inner Wheel President Cathy Griffin's chosen charity, the Genesis Research Trust. This charity does exceptional work in funding research that aims to improve the health of mothers and babies during pregnancy. President Cathy Griffin with Immediate Past President Diane Addy. Cathy then went on to introduce her guest speaker Mr Chris Turner. Chris is a pharmacist by profession. Chris and his business partner Andrew Bailey, both graduates of Keele University, realised that there was the need for a service, which is different to the traditional pharmacy. In a traditional pharmacy, the customer will go into the pharmacy and speak with the staff. This is not always possible. If people are very unwell or simply have a busy life that does not accommodate visiting the pharmacy. Whilst we are all encouraged to register a pharmacy with our GP, they cannot always deal with all medication and you still have to arrange to call to collect your prescription or have it delivered. The two friends realised there was a potential gap in the market and set up DIMEC Pharmacy. The start-up company was launched in November 2014 and has grown steadily since. Dealing with not only NHS prescriptions but also retail medicines, private prescriptions and veterinary medicines that are delivered to your door, the internet business has expanded. A number of members asked questions and could see the benefits. For more information, go to DIMEC Pharmacy on the internet. President Cathy with Chris Turner. It is not that Cathy is small but rather that Chris is very tall!! The Inner Wheel Club of Church Wilne and the Rotary Club of Church Wilne are sister and brother organisations. Whilst it is not a requirement that an Inner Wheel member has a husband or partner who is a Rotarian, the two clubs do hold a number of joint events. One of the first events in a new president's year for both clubs is the "Meet the Presidents" event. This year the new President of Inner Wheel, Cathy Griffin and Rotary President for the year Simon Beal held an informal get together for both clubs at Risley Village Hall. Rotary President Simon Beal with Inner Wheel President Cathy Griffin. This event is followed by the first engagement of the year for the incoming President when she attends a meeting of the Rotary Club of Church Wilne to talk to the members about "women's issues" and her plans for the coming year in office. Following the hand over from Diane Addy to the new President Cathy Griffin the old and the new committee had their, what is now, traditional evening of fellowship together. A good meal was enjoyed with plenty of chat and much laughter. Diane with Cathy at the presentation. One of her first duties as club president Cathy Griffin makes a presentation to Immediate Past President Diane Addy on behalf of the committee both past and future. The gathering at the table. From the other end to catch all present. The fourteen past and future committee members in no particular order – Diane Addy, Cathy Griffin, Angela Beal, Pauline Sheehy-Smith, Stephanie Cook, Andrea Tew, Ann Gregory, Julie Huggett, Jane Markwell, Margaret Stevenson, Monica Wellborne, Shirley Martin, Yvette Thomas, Karen Knapp and Paula Jones. Here are the answers to the Who's that baby quiz from the November meeting. 5 - Paula Jones, 6 - Karen Knapp, 7 - Cathy Griffin, 8 - Diane Addy, 9 - Stephanie Cook. 18 - Margaret Stevenson, 19 - Monica Welbourne, 20 - Kathleen Gillen, 21 - Joyce Stokes. 22 - Julie Barber, 23 - Ann Austin, 24 - Jane Page, 25 - Margaret Abbott. How any did you get? To return to the report, click here.